Landsknechts. 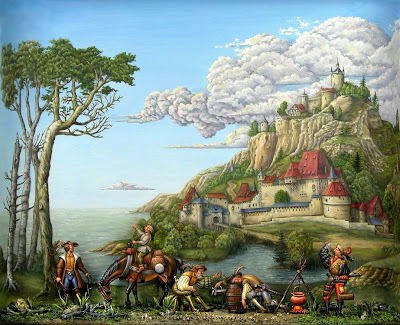 A masterpiece showing a camp of landsknechts painted from the collaboration of Franzoia Serge (background) and Gianfranco Speranza (figures). Modeling is a love at first sight. As most of the people involved in one way or another in this hobby, I started assembling and painting plastic kits of any kind. It didn’t’ matter if it was a plane, a ship or a tank. At the beginning at least. 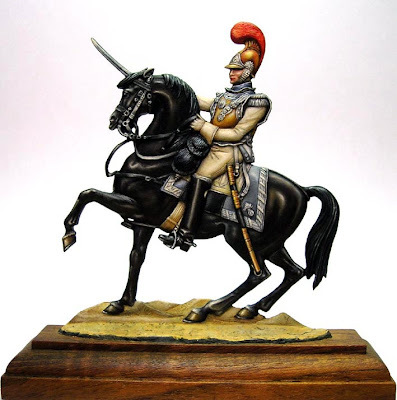 Soon after my first plastic kits, I discovered the world of figures in a form of a 90mm Samurai, a Hussard du Marais old metal kit. Assembling and painting took me 2 days and the result was monstrous. Still, the figure was so good to my eyes that I bought my second one and then everything begun. Every figure had something new for me. Different historical periods, different techniques, different painting mediums, each figure was a new experiment and a new excitement. Meanwhile, collection of modeling and historic books became a must since I wanted to accurately reproduce each figure as a personality or a human being that lived, breathed and fought a long time ago. While browsing the books and web for new products or various references, I kept catching myself being fascinated more and more from a peculiar form of a figure, nearly flat with a slightly engraved detail on it. Buying something like this in my country was out of the question, but with the help of internet services, I bought my first series of 30mm flats. The famous “ Napoleon at the Pyramids” by Mohr. It was then that I realized that flat figures was a passion that overshadowed all other kinds of modeling art. But the most attractive feature of the flat figure collection is the variety of subjects. We want prehistoric hunters hunting down a bear? Here it is. Biblical themes? Sure. Ancient Greeks, Assyrians, Sumerians fighting? Of course. There is no end in the variety that flat figures cover the human history. Prehistoric times, Ancient, Roman, Medieval, Renaissance, Napoleonic, until modern times of today, all are represented from various designers, engravers and editors. And not only themes from military history, but thousands of civilian figures accurately representing nearly every aspect of everyday life through the ages. So what choices someone has when the time to buy a flat figure comes? Answer is: Plenty of choices! Flat figures come in scales from 10mm to 150mm with various steps between these 2 numbers. Traditionally, most of flat figures are 30mm (or 28mm if we want to be accurate) but lately 54mm and 90mm have also a quite large variety of subjects depicted. For starters, I would recommend a small sample of these 3 scales so everyone can see if the scale suits his taste and/or his craftsmanship. Personally I tried different scales, before I settled for the 30mm one. Of course I won’t reject a beautiful figure simply because it’s larger. Some figures are excellent in any scale and you just have to paint them. One other choice someone has to make before buys a flat figure is what this shall represent. Will it be some ancient people taking a bath? A party of medieval people having a good time in a tavern? A phalanx of Macedonians advancing? Or maybe an elephant tries to squeeze some poor fellow bellow its ferocious sole? Again choices here are limitless. One approach would be just to pick any figure or set of figures that look nice to our eyes and taste. Nothing wrong with this. In fact many people buy goods this way. I know, sometimes I do it. Another approach, a little more sophisticated, is to decide if we want civilian or military subject. After this, decide which time period we are interested in, which nationality we would like our figure to be part of, foot figure or mounted? And so on. Step by step we can easily narrow our choices and decide exactly what we want to collect, buy and paint. Most probably it will be depicted in one way or another in flat figure form anyway. Let’s start our journey through the wonderful world of flat figures from the very beginning. Where to buy these figures? Magnificent French Carabinier from the Danish artist Kjeld Buchholtz.